Teen favorite budget clothing store Urban Outfitters has really made its mark in the industry, becoming one of the major multinational companies to spread out from the United States into Canada, Belgium, Denmark, France, Germany, Ireland, the Netherlands, Sweden and the United Kingdom. It is the composition of all that is vintage, retro, hipster and ironically humorous, ensuring every piece and product appeals to the mass public. The company’s own brands include Kimchi Blue, BDG (Bulldog), Pins & Needles, Sparkle & Fade, Silence + Noise, Coincidence & Chance, Deena & Ozzy, Ecote and Staring at Stars. Urban Outfitter’s has even taken home the People’s Choice award among many others, staying true to its ideals in being able to always connect with the customer. 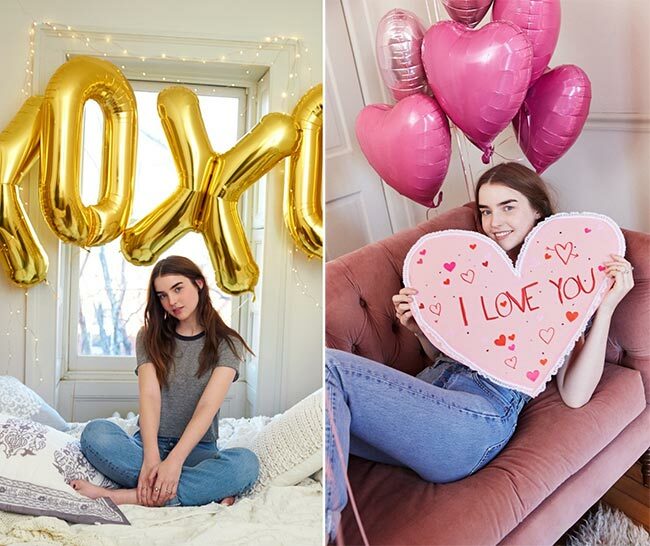 With all its appeal to the local public, it’s no wonder the brand has unveiled the Urban Outfitters Valentine’s Day 2015 lookbook, featuring cute and vintage all in one. They’ve cast Ali Michael and Marcel Castenmiller as their models for the photo shoot, bringing in true love through the real couple’s body language. They enjoy sweet kisses and listen to old vinyl records, while perusing through jewelry, mugs, tech accessories and the brand’s signature lines of clothing. 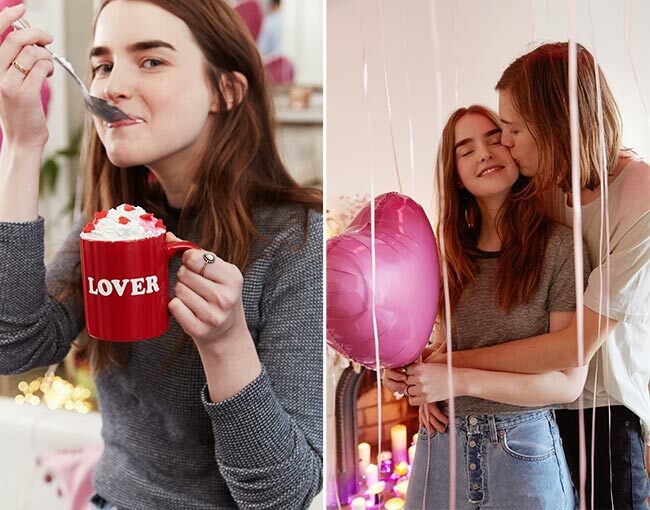 It’s nice to see true chemistry in the eyes of models, particularly when Urban Outfitters has ensured they look like your average youth in love. This means little to no makeup, simple clothing styles and amazingly real poses. The heart balloons, the candles and pretty decorations all say what the headlines do not. Urban Outfitters has all you need to make this Valentine’s Day as special as it seems to be for the couple we are staring at. Plus, those jeans are lovely! The high waist is definitely something we covet, and the button down style adds to the more alluring appeal. After all, it would be so easy to unbutton those pants for a physical act of the love portrayed. The short-sleeved blouse is comfortable and a perfect match with those jeans, while the male clothing is light and airy, simple but stylish. Of course, you can always trade in the short sleeved top for an airy tartan shirt in darker red coloring, keep the jeans and let yourself enjoy good old-fashioned music on vinyl records, laying against the couch with a throw kept nearby just in case you feel the chill. Certainly a great photo for Urban Outfitters. Those shoes‚Äö√Ñ√∂‚àö√ë¬¨‚àÇ for both the male and the female. 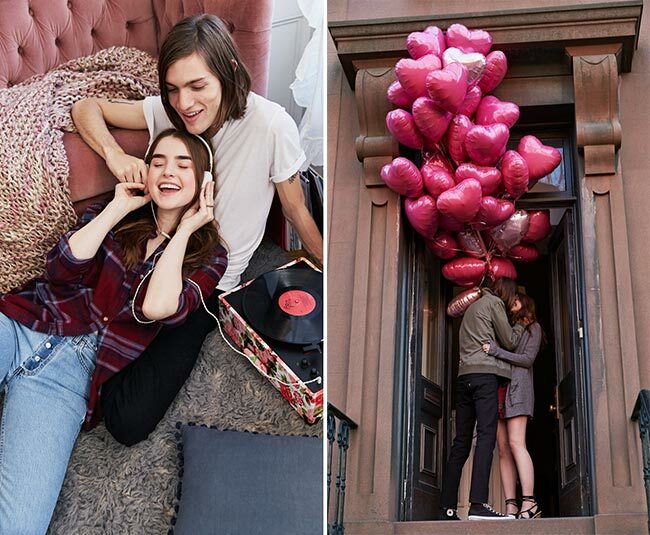 The converse and the strappy stringy sandals really are Valentine’s Day worthy, while those balloons undoubtedly bring the attention up towards the kiss. Of course, a date requires you to be looking pretty but also ensuring you are warm against the winter weather, which is there the black jeans look great for the male outfit and the red mini dress with the grey cardigan with hemlines at the same length work pretty well. It’s a great date look for the upcoming holiday of love.